Super Bowl XLVII is on! Our San Francisco 49ers VS the Baltimore Ravens. The Bay Area is in the midst of a great sports year with the SF Giants having won the World Series and now the Sharks & Warriors enjoying winning streaks. We also added apples & carrots to the menu. 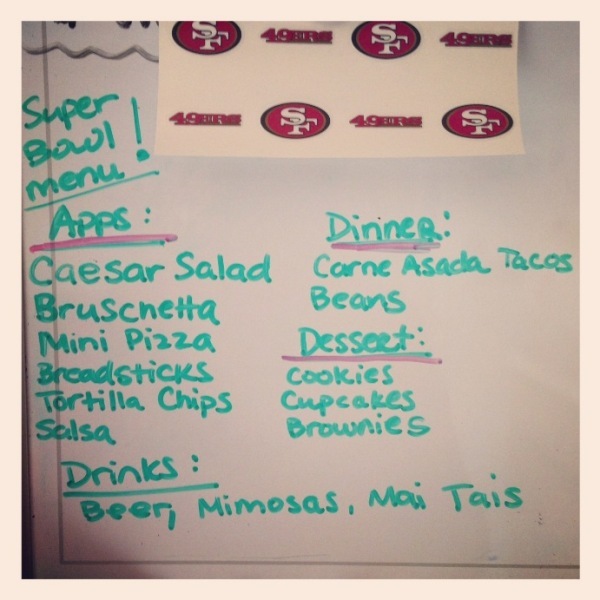 At our house, the game day menu is sure to satisfy anyone with an appetite for yum. The appetizer and dessert table is set-up for our friends to indulge, laugh, cheer, boo, critique commercials and have a great time. After halftime, my honey will serve up the carne asada tacos which are sure to be a hit with the crowd - no matter what the score is. Apps and desserts are on the table! Win or lose - nobody's got it better than us! I love my family.